Left-wing group Peace Now reported on Tuesday that tenders have been announced for 20,000 new homes in Judea and Samaria, a figure which the group calls a new "record." 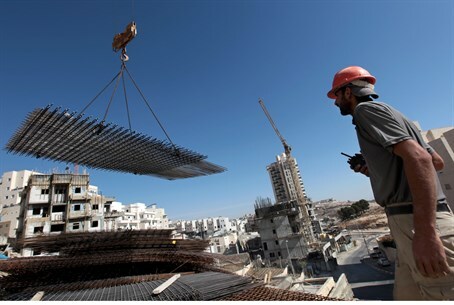 Peace Now director Yariv Oppenheimer told AFP that the housing ministry had announced the tenders, claiming that the dedication of public funds for construction shows government commitment to building in Judea and Samaria. He further alleged that the announcement shows the government is "only pretending to negotiate" with the Palestinian Authority (PA), and shows that Prime Minister Binyamin Netanyahu, according to Oppenheimer, "does not believe in a two-state solution." Meanwhile Netanyahu's office hurried to stress that he had opposed 1,200 of the 20,000 homes which are set to be built in the E1 area connecting Jerusalem to its eastern suburb Ma'aleh Adumim. Building plans in that vital area for Israeli contiguous control have elicited Arab protest in the past. The construction announcement comes despite American pressure on Israel, as US Secretary of State John Kerry last Wednesday said America views Jewish building in Judea and Samaria as "illegitimate." His comments came following PA criticism of recent Israeli building plans for 1,500 new homes in eastern Jerusalem in addition to 3,360 new homes in Judea and Samaria. The PA reacted, claiming that such moves showed Israel "was not serious in the negotiations," and threatening to end the peace talks. Meanwhile Housing Minister Uri Ariel (Jewish Home/Bayit Yehudi) responded to international criticism by saying "no country in the world accepts diktats from other countries on where it is allowed to build or not." The newest announcement comes on the heels of governmental approval for a new city in the Negev called Kasif for the hareidi-religious community, as well as a new village also in the south called Hiran for a religious-Zionist community.